The campaign for a Robin Hood Tax began, a little over 18 months ago, with a little-noticed launch in London. Supporters from a handful of British charities, faith groups and unions projected images onto the Bank of England, in an effort to lobby the British government to introduce a new tax on banks to tackle poverty and climate change. Today, it has become a global movement. It's easy to see why it has been taken up by large parts of the Occupy Movement, which also began as a small gathering on Wall Street opposing US corporate greed and the role of the top 1% in dictating priorities in Washington, and has now become a global awakening. What has driven both developments is a realisation that the current world order is failing us -- the 99% around the world -- and that to fix it, we need to change the system. The catch-cries of the last great global uniting -- the anti-capitalist movement which arose after the protests against the World Trade Organisation Summit in Seattle in 1999 -- have returned. "Another world is possible, a better world is possible". This global vision inspires us, it connects us with people around the world, whose coordinated action and common purpose is essential to make that system change, and create another world. But we all begin this journey from where we are, in our own countries, our own cities and communities, with our own histories and our own specific obstacles to change. A Robin Hood Tax in New Zealand would require a radical overhaul of our system of taxation. So it's important to examine our current system and how we ended up with it, which leads us, at the start, to the last radical overhaul of taxation in New Zealand. This occurred during the second term of the Fourth Labour government, under prime minister David Lange, finance minister Roger Douglas and the front man, revenue minister Trevor De Cleene. Up until the mid-1980s, New Zealand's tax system collected revenue mainly from income and company profits. It was a progressive system, which meant those on higher incomes paid a proportionately higher share of tax. The top tax rate was 66 cents in the dollar. This was widely seen as fair. After 1986, reform of the tax system shifted revenue collection away from income and onto consumption, through a new Goods and Services Tax (GST). In presenting the tax reform bill to parliament in 1988, Trevor De Cleene explained the case for GST. "The previous system", he said, "led to many people entering into avoidance and evasion mechanisms that defrauded the revenue… The Government is not interested in encouraging people to do that. It would rather set tax rates to encourage people to be honest, as people intrinsically are, and not to say to them, at 66c and other ridiculous rates, that they have a moral excuse for not paying the tax." Let's translate this politician-speak. If you ask rich individuals and companies to pay their fair share, suggested the revenue minister, they will simply find ways of disguising their income and profits. So rather than confront wealthy individuals and corporations, it's better to ask them nicely to pay less tax, and rely on their conscience to comply. The top tax rate was halved from 66 to 33 cents in the dollar. This tax reform was part of a wholesale shift in government policies, including privatisation and deregulation, removing restrictions on trade and investment and allowing free movement of capital. Floating the New Zealand dollar and deregulating the financial services sector allowed a new breed of traders to make fortunes speculating on the value of currencies -- including a young currency trader by the name of John Key, who went on to become the global head of foreign exchange at the now defunct Wall Street brokerage, Merrill Lynch. Carried on by the National government which was elected in 1990, New Zealand's neoliberal revolution drove the biggest transfer of wealth from the poor to the rich in our country's history. In 1996, The Economist magazine ranked New Zealand as the third most unequal country in the world. Renowned academic Brian Easton identified the two main drivers of the massive growth in inequality as National's 1991 benefit cuts and Labour's tax reforms. Of course, New Zealand companies did not discover a conscience after Trevor De Cleene's speech, and start paying the new, reduced tax rate. They took Labour's tax reforms as a green light to pay even less. In 1995, the Winebox Inquiry (named after the carton of documents tabled in Parliament by Winston Peters) revealed that New Zealand companies paid an average of 7.6% tax in 1990-91, and 10.6% in 1993-4. Most of New Zealand's largest corporations -- including Fletcher Challenge and Lion Nathan -- actually received more in tax refunds than they paid out. They were able to do this thanks to the neoliberal deregulation of the finance sector, allowing free movement of capital into offshore accounts. 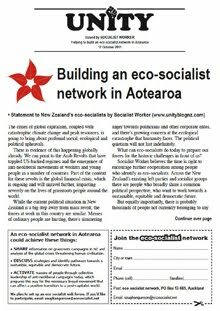 I'd like to step aside, for a moment, from my role as Tax Justice spokesperson, and make a few comments from a socialist perspective about New Zealand's neoliberal revolution. Conventional wisdom on the Left holds that neoliberalism was imposed on New Zealand by a small group of extremists at Treasury, working with a handful of like-minded Labour MPs under finance minister Roger Douglas. This explanation portrays the neoliberal revolution as a conspiracy, a policy coup even, by a tight cabal. In reality, as Otago University academic Brian Roper has shown, neoliberalism was embraced in the 1980s by almost all of New Zealand's business organisations, from the Business Roundtable to Federated Farmers, as a prescription to revive capitalism. Mirroring global trends, the three decades from 1945 had seen the biggest economic boom in New Zealand's history. But from 1974-1985, economic growth averaged just 1.8 -- less than the rate of population growth -- as company profits nosedived. Capitalism needs a continuous flow of profits and endless economic growth, or it will collapse. Neoliberalism revived capitalism by creating new sources of profit -- above all in the massive expansion of the financial sector. This happened within New Zealand, and around the world. (For a more in-depth explanation of the financialisation of capitalism, I'd encourage people to look to the authors associated with the New York-based Monthly Review journal, http://monthlyreview.org/). Viewed from the perspective of 2011, however, the financialisation of the world economy can be seen as simply building capitalism's house of cards even higher. Coming on top of the climate crisis, peak oil and other resource crises, the crisis of popular legitimacy for governments around the world and the waning of the United States as a global superpower stabilising the system, the current financial crisis could be sounding the death-knell of the capitalist system. So how does this relate to the Robin Hood Tax and Tax Justice? Corporate tax avoidance in New Zealand did not end after the Winebox Inquiry. It continued in the new heart of our new, financialised economy -- particularly in the banking sector. Between 2000 and 2006, the "big four" Australian-owned trading banks (BNZ, ANZ-National, Westpac and ASB) avoided paying at least $2 billion in tax through complex mechanisms known as "structured transactions". The details of this tax avoidance are only publicly known because they were caught and successfully prosecuted. What the case shows is that banks were effectively setting their own tax rate, more concerned about public opinion than the legal requirement to pay the official company tax rate of 39 cents in the dollar. In fact, between 2000 and 2006, the "big four banks" paid an average of just 6.7% tax on their profits. The end of this story is like a scene out of "The Inside Job". This year's Oscar-winning documentary is a must-see film. It details how Wall Street bankers worked with neoliberal politicians to rort the system, bring the global economy to its knees, then escape responsibility and continue to direct government policy. After advising Westpac on how to pay nominal taxes, John Sherwin went on to become chairman of the New Zealand division of accounting giant PriceWaterhouseCoopers, and last year the National government appointed him to their advisory Tax Working Group. Stories of tax avoidance like these explain the beauty of GST, from the perspective of its architects like Trevor De Cleene and of National and Labour politicians ever since. GST is easy to collect and very difficult to avoid. What is not usually highlighted is "who" has difficulty avoiding it. GST falls only on consumers. And the poorer you are, the more your income is caught by GST. As a consumption tax, GST is regressive, for the simple reason that any portion of income which is saved or invested is tax-free. To put it another way, those who live from pay-day to pay-day, spending all their money on the goods and services they need to get by, would pay tax on every dollar earned. But those wealthy enough to put some aside each week pay no tax on that portion. The richer you are, the more you avoid paying tax through GST. Which brings us finally to the global campaign for a Robin Hood Tax. The British-based campaign began by putting up three options. The first was a Financial Activities Tax, also known as a FAT. Under this proposal, a new tax would be levied on bank profits and executive remuneration packages. The second was a Bank Levy. Under pressure from voters and campaigners, the British government actually introduced a flat-rate levy on large financial institutions in the UK . However, the British tax does not catch the majority of financial transactions, and the rate is very low. The third option is a Financial Transactions Tax (FTT). This is described as "the best of the lot". This would be a tiny tax on all transactions like stocks, bonds, foreign currency and derivatives. It is well-tested, cheap to implement and hard to avoid. A Financial Transactions Tax is the mirror image of GST. It is progressive, instead of regressive, targeting the super-rich instead of the rest of us (consumers). Like GST, it is very hard to avoid, and just as easy for the government to administer. It confronts the reality of today's financialised economy. A FTT would finally put an end to decades of corporate tax avoidance and evasion in New Zealand, and reverse the neoliberal tax reforms to make the rich pay a fair share once again. From an eco-socialist viewpoint, a Robin Hood Tax has an additional merit. When a physical structure collapses, it can fall in different directions. By analogy, as capitalism nears collapse as a social and economic system, it too can fall in different ways. A campaign to target the heart of global capitalism with a FTT can not only hasten its demise, it can also help ensure that the system collapses in such a way that it does not crush human civilisation when it goes. The global campaign for the Robin Hood Tax, meanwhile, is growing. In early 2010, president Lula of Brazil announced his support for a FTT, followed by an announcement from the European Parliament. In September last year, more British trade unions came on board the campaign at the TUC Annual Congress. In November, South African Health Minister Aaron Motsoaledi declared his support. A proposal to tax currency trading had been made at the September UN Summit by the expert group to the Leading Group on Innovative Financing for Development (backed by 60-odd countries including the UK). But Mostoaledi went further, welcoming: "A small tax on transactions in the financial sector, clogged and overheated. This would have the dual benefit of reducing the irresponsible behavior that contributed to the economic crisis, while raising billions of dollars in new resources to invest in key priorities, nationally and internationally, including the fight against the disease." In February of this year, campaigners in 25 countries took part in a global day of action, calling on the G20 Summit in Paris to support a Financial Transactions Tax. In May Finland became the first country to announce it will implement a Robin Hood Tax -- alone, if necessary. Deputy Prime Minister Jyrki Katainen told a news conference that "Finland will push for a global financial transaction tax… We favour a European bank levy, and if there is no agreement, Finland is ready to have a domestic one." 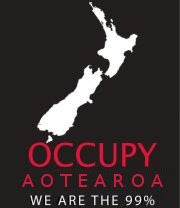 Another global day of action in June involved activists in 43 countries, including here in New Zealand. In August, the International Monetary Fund (IMF) released a paper on the Robin Hood Tax. "In principle", it said "an FTT is no more difficult, and in some respects easier, to administer than other taxes". The paper added that whilst international agreement enhances the viability of an FTT, several countries have successfully introduced them on a unilateral basis. After this, the French president, Nicolas Sarkozy, and German Chancellor Angela Merkel announced their support. In September, nurses in 21 US states demonstrated in for a Robin Hood Tax to "heal America", and Microsoft founder Bill Gates declared his support. The European Commission announced that a FTT will be in place across the European Union from 2014. And last week, the Pope endorsed a tax on financial transactions to help low income countries suffering the effects of the financial crisis. Here in New Zealand, the push for a Robin Hood Tax took off last year, when Oxfam NZ and the Tax Justice Campaign each launched campaigns in support of the British initiative. 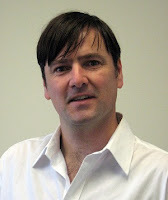 Since then, the idea has been taken up by a number of trade unions, including the Service & Food Workers Union, Maritime Union, the National Distribution Union (which has now merged with the Finsec bank workers union to form F1RST Union), and the Wellington Regional Council of the NZ Nurses Organisation. The Council of Trade Unions Alternative Economic Strategy, launched in 2009, included a financial transactions tax on cross-border currency trades, and earlier this year CTU secretary Peter Conway added his name to a letter from 1,000 world economists calling on the G20 to support a Robin Hood Tax (along with three other New Zealanders -- Prue Hyman, Stefan Kesting and Petrus Simons). Even business leaders are starting to express support. Brent Robinson, founder of Auckland hi-tech firm Rakon Industries, has called for a financial transactions tax on the "hot money" flows into and out of New Zealand which are destabilising the dollar. The New Zealand campaign reached its high-point in August, when the Tax Justice Campaign presented a 40,000 signature petition to Parliament calling for a Robin Hood tax on financial speculation and the removal of GST from food (as an achievable first step to scrapping GST altogether). In less than a month, New Zealand will go to the polls to elect a new government. While we're building the nucleus of another world in the occupations, and in our communities, we should also remember that for the 99%, the election is also part of creating this future. So I'll conclude with a look at the tax policies of some of the political parties. "it would stampede capital out of NZ. Investors can choose where they invest. The money that did stay would be more expensive. We would all pay higher mortgages and rents. Second, poorer NZers including most Maori would pay proportionately more - in the same way as those on low incomes pay proportionately more on GST - because they spend and transact all that they earn. An FTT is likely to be regressive." The first part of this explanation re-hashes the neoliberal ideology that in an age of freely moving capital, the role of government is to make New Zealand attractive to business as part of boosting "international competitiveness". It's policy made bowing to the rule of the market. Like neoliberal ideology as a whole, it's also untrue. The London Stock Exchange has a financial transactions tax, called the Stamp Duty, levying 0.5% on the value of all trades. This hasn't seen a stampede of capital out of Britain. The last part of Cunliffe's explanation is simply mistaken. A FTT will not target low income New Zealanders more, because unlike GST, all transactions (not just consumer purchases) will be caught in the tax net. Instead of a Robin Hood Tax, Labour is promoting a Capital Gains Tax (CGT). A CGT, exempting the family home, would be a positive step. But it has problems. The main one is that a CGT on property is relatively easy to avoid. All it takes for a property speculator to dodge it (as a well-fed army of accountants and tax lawyers are already advising) is to live in a house -- or make it appear that the owner is living in a house -- for a few months prior to sale. The second problem is who it targets. Property is the most common form of investment in New Zealand. Around 10% of income earners own an investment property -- with the majority owning one to three houses, in addition to their family home. Even though the collapse of the property boom has left some of these people struggling, this group can, and should pay more tax. But a CGT does not zero in specifically on the 1%, the Rich-Listers like John Key, whose wealth rose by $7 billion in the last year. Avoiding a Capital Gains Tax will be relatively easy for these people. Despite Labour's policies, the Tax Justice Campaign has received support from people in the Labour Party, notably from Manurewa MP Su'a William Sio. The Green Party, for its part, says it would support a limited form of FTT called a Tobin Tax, just on currency trading -- but only if it was introduced internationally first. Leading figures in the Party continue to argue that a FTT would be impossible to introduce in individual countries, such as New Zealand, even after the IMF showed its viability. The Greens also opposed removing GST from food, or even off fruit and veges. Last month, co-leader Metiria Turei suggested that this wouldn't really help low-income New Zealanders. Instead, the Greens also favour a Capital Gains Tax. In practice, this has meant no support from the Green Party for the Tax Justice Campaign. The Maori Party and the Mana Party are the only parties currently in parliament publicly supporting a Robin Hood Tax and the reduction, or removal, of GST. The Mana Party has campaigned most strongly for these changes, re-branding the Robin Hood Tax as one indigenous to New Zealand -- the Hone Heke Tax. Outside of parliament, there is also the Alliance Party, which co-founded the Tax Justice Campaign along with Socialist Worker. Whoever wins the election, the issues of Tax Justice and the need for a Robin Hood Tax in New Zealand are only going to grow. This is why we are calling for the formation of a bigger, broader Tax Justice Coalition. Our campaign has been able to generate debate and show support for removing GST from food and taxing financial speculation. But we have been too small to give the Robin Hood Tax the push it needs. Next year, we want to carry the debate further into the Labour and Green Parties, into civil society organisations, and into the mainstream. 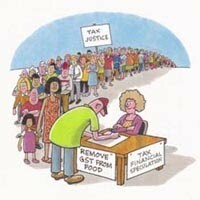 A new Tax Justice Coalition can do it.